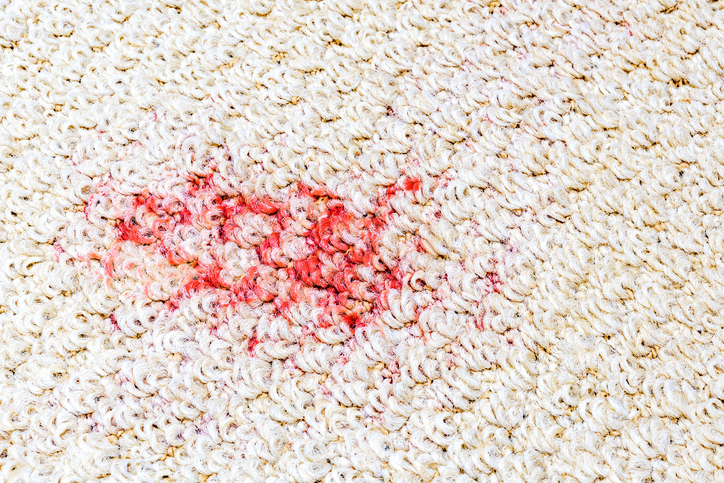 How Can I Clean Stains From My Carpets and Rugs? The time to take care of spills, spots or stains is immediately after they occur. Use a spoon to remove all solid materials, then blot the spill using clean white tissues, napkins or towels. Pretest spot removal formulas (see below) in an inconspicuous place. If the dye bleeds, have the rug professionally cleaned. Do not over-wet the rug. Work with small amounts of formula and be sure to blot — do not rub. Rubbing can cause permanent damage to the rug fibers. As you blot, work from the outer edge of the spot toward the center. Be patient — some stains respond slowly. Remember, haphazard attempts at spot removal may result in permanent stains or damage. Certain stains require special professional care. Find your specific stain on the key at the bottom of the page and use the corresponding numbered formula to clean the spot. Apply small amounts of the cleaning solution with a clean white absorbent towel. Blot frequently and continue to apply and blot until the stain is no longer transferred to the absorbent material. Finally, blot any remaining moisture or cleaning solution by pressing the area with absorbent towels. Weight it down and allow at least six hours to dry. Below are several cleaning formulas used for stain removal methods. We are happy to share these formulas with you, but for serious stains, please contact us as soon as possible for the best chances of removal. Formula 1: Apply a small amount of dry cleaning solvent or alcohol. Use small amounts to prevent any possible damage. NOTE: DO NOT USE GASOLINE, LIGHTER FLUID or OTHER FLAMMABLES. Formula 2: Mix one teaspoon of white neutral detergent (a mild liquid dish washing detergent containing no strong alkalis or bleaches) with a cup of lukewarm water. Formula 4: Mix one-third cup of white household vinegar with two-thirds cup of water. Formula 5: Mix a solution of powered enzyme laundry detergent following label directions. Follow the label directions. Allow the solution to remain on the stain for the length of time recommended by the manufacturer. Note: Never Mix Ammonia and Bleach during the cleaning process.